A speedy train transported us from Rome to Florence. (The train went about 190 mph... Mike did the kph to mph conversion for us.) The train station in Rome was quite the adventure, what with the locals stealing my luggage and putting it on the train for me, despite my desire for them to NOT do that. 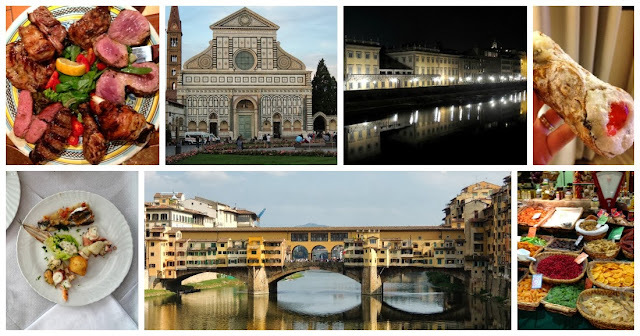 Everything in Florence was within walking distance, so we just meandered around the town on our first night. We had an amazing dinner at Giannino in San Lorenzo. I ordered Ricotta Cheese and Spinach Ravioli with a Black Truffle Sauce, and Mike had a delicious meal of roast pork. And of course a liter of vino della casa. 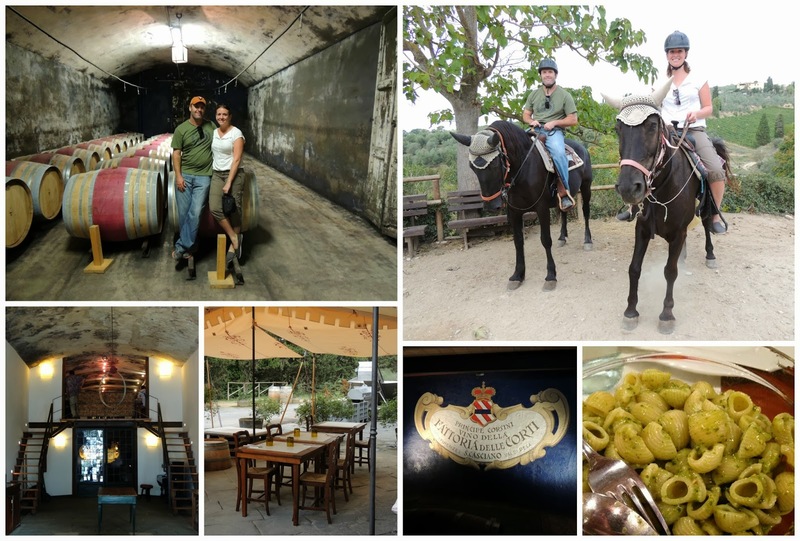 On our second day in Florence, we went on a horseback riding trip through the Principe Corsini estate and vineyard in Tuscany. This was only my second time riding a horse, and what an awesome experience it was. My horsey was named Violina, and Mike's was Julia. Violina stopped to snack on some grape plants and weeds a few times, for which she was immediately scolded by our awesome tour guide. I've never heard an animal be scolded in Italian, and it was quite entertaining, let me tell you. We learned all about Chianti wine, which can only be made in that particular region of Tuscany. We sampled two different wines at the winery and had an authentic Tuscan lunch of pasta with a marinara and pesto sauces. This day trip is one of my favorite experiences in Italy. It was an absolutely picturesque dream come true. The restaurant only has 2 seatings: 7pm and 9pm. When we got there at 6:40, a crowd of people was already forming outside the doors (which were locked until 7pm). As soon as the host came to unlock the door, I felt like I was in the middle of the antelope stampede in the Lion King, and I was poor Simba. I was pushed, shoved, smacked in the face (just kidding - kinda) by men and women, young and old, trying to get in the front doors to be seated. The host held a piece of paper, which apparently listed the names on the reservations, and would give people a head nod, or a head shake, signifying whether they were allowed to enter the restaurant or not. Once we were inside, we were seated at a four-top table, next to another couple. Soon after, a waiter came and told us (with a hard-to-understand Italian accent) about some appetizer special and asked if we wanted to order it, without ever giving us a menu. I asked him if they had a menu we could look at, which he begrudgingly retrieved for me. The menu was written in Italian only (this is the first and only menu we saw on our entire trip that did not list English translations), and was promptly taken away from me by another waiter. We ordered a bottle of house wine, even though we never saw a wine list. We then ordered the appetizer special because it seemed like the thing to do. It turned out to be a few slices of prosciutto, a few chunks of cantelope, some tomato slices, and some (delicious) homemade ricotta cheese. Besides the ricotta, it wasn't anything to write home about. Someone brought out the three "small" portions, which were exactly the same size as the one pasta dish that our table neighbors ordered. Since we still hadn't seen a legit menu for any significant amount of time, we had no idea how much any of this cost. We proceeded to eat all of the pasta dishes, none of which were very exciting. We were thinking we really didn't need much more to eat after all of those pasta dishes, BUT we had heard how delicious Tuscan Steak was from our horseback-ride tour guide. So we figured this would be the place to try it while we were in Florence. When they brought out this steak, Mike and I just looked at each other with wide eyes. This bone-in steak probably weighed 6 pounds, 2 - 3 inches thick, and took up an entire platter. Even though we were sharing this steak, there was no way we could eat it all (and Mike can certainly eat a lot of steak!). We did the best we could. Next the waiter tried to convince us that we needed a dessert or an after-dinner cocktail. I politely declined, considering the fact that I had just ate half a cow and a pound of pasta. The waitstaff then proceeded to bring us some biscotti and a couple shot glasses of Vin Santo. Finally they brought us 2 glasses of Prosecco, which we did not order, and were told it was a gift. Thirty minutes later, someone came back to check on us and we asked for the check. In Italy they don't seem to be in any hurry to give you your check. And we had no idea how much it was going to be, and were a little nervous about it. Our waiter muttered something in Italian to the official check-writer guy, who proceeded to write down on a piece of paper how much we owed: 100 Euro. That's it - nothing was itemized, no idea what cost what, just 100 Euro even. Our waiter then kindly told us that this did not include tip (keep in mind, in most places in Italy, you do not tip). Who knows what we paid for, what anything cost, whether we could have ordered a dessert and paid the same thing. I don't know. I would not recommend this place, unless money is no object for you. The food was just OK. I felt like we were tourists being taken advantage of. 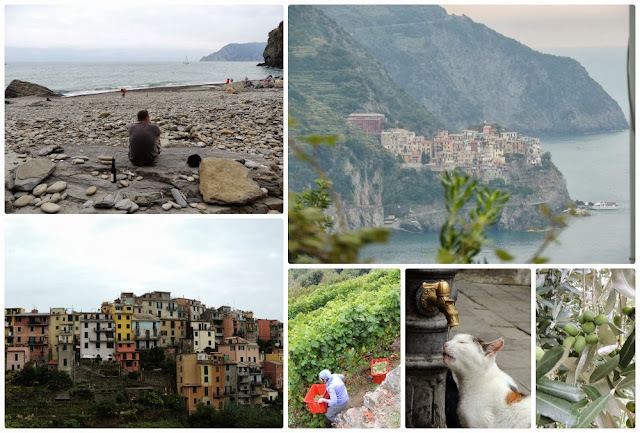 On our third day in Florence, we took a day trip to Cinque Terre. History Lesson: Cinque Terre, which stands for "The Five Lands" is on the Italian Riviera, and is composed of five beautiful fishing villages: Monterosso al Mare, Vernazza, Corniglia, Manarola, and Riomaggiore. Over the centuries (these villages have been around since the 11th century), the people who have lived here have built terraces on the steep landscape right up to the cliffs that overlook the sea. The villages are all connected by a hiking trail, which we used to get from the 2nd town to the 3rd. Along the trail, we saw people harvesting grapes, a ton of olive trees, kiwi trees, and a plethora of other fruits and vegetables. We had a delicious, locally-caught seafood lunch in Corniglia at a beautiful family-owned restaurant called Cecio Ristorante Camere. We bought a bottle of local white wine at a little shop in Vernazza, and enjoyed it on the beach. I collected handfuls of sea glass and beautiful clay pieces which Mike happily (er, 14 comments later) lugged all the way back to Florence for me. OH - and there was an adorable kitty drinking out of a water fountain. On our last day in Florence, we went to a phenomenal pasta-making class (see blog post and recipes here). We explored the city, and had a delicious dinner at Osteria Santo Spirito. I ordered Spaghetti Aglio Olio e Peperoncino (Spaghetti with garlic, olive oil, and peperoncino chili peppers), which was my favorite pasta meal. Mike ordered a Mixed Meat Grill platter, which we think included roast chicken, beef, lamb, rabbit, and sausage. We took two of those super-fast trains from Florence to Lake Garda. 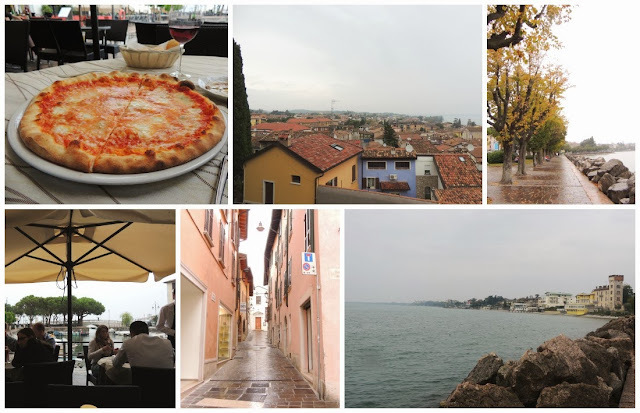 (When planning our trip, I wanted to visit Lake Garda to ensure we would have at least one day of downtime, where we wouldn't feel pressured to sight-see all day long.) Unfortunately, it was raining when we were there, so we could not see the Swiss Alps on the far side of the lake like as I had hoped. The town was quaint, with plenty of shops and restaurants and pretty views of the lake. Lake Garda was the home of our favorite Italian pizza: Quatro Formaggi (with gorgonzola). I never would have thought to put gorgonzola on pizza, but boy is it tasty! Yet one more super speedy train from Lake Garda to Venice, our final stop. We stepped out of the train station, expecting to get a taxi to our hotel, which was about 2 miles away... and it was raining. But to our surprise (and demise) all we saw outside were WATER taxis. I didn't quite understand that Venice only had boats, and absolutely no cars. Oops. So we walked. 2 miles in the rain. Uphill both ways (seriously, we walked over about 30 canals with lots of stairs). We stayed at Hotel Metropole. We ate dinner at Da Mario alla Fava Ristorante, which Siri found for us. It was a small, hole-in-the-wall restaurant down a tiny alley. The noteworthy part about this restaurant was the menu situation (and the fact that the women's toilet was 1 foot off the ground, like all Venician public restrooms). Mike was given a menu with prices; my menu did not list a single price. It took us a while to figure this out. When we did, the American couple sitting next to us said their menus were the same way. Apparently women can't handle making decisions when money is involved? Come on, Venice, get real. Yes, we went on a gondola ride. It was at night, a little chilly, and I didn't even get to sit next to my hubby because we were the last of 3 couples to be seated in the boat and had no choice. I finally got some tiramisu, and am now addicted. We had one of our favorite meals here, which happened to be our very last Italian meal, at Rossopomodoro. Mike ordered the special that day: scampi with king prawns. He loved it, and everyone sitting around us took one look at his, and ordered that for their meal. Overall, Venice was beautiful and we loved it. It was rainy on our first day, so I can understand why some people have had not-so-favorable experiences here, but it was sunny and gorgeous on our second day and was perfect for us. On our last day, we finally took a water taxi. That was the only way to get to the airport. The "taxi" ride was about 40 minutes long, and I was a little sea-sick by the time we finally got back to land. 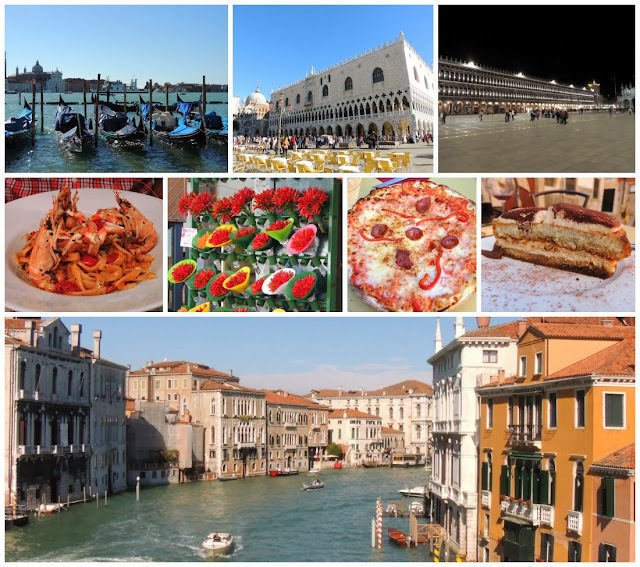 I hope you enjoyed reading about our adventures, please feel free to email me if you're planning a trip to Italy and would like more information!